Notes: The forecast promised a fairly dull day, but the morning brought a few shafts of light poking between the clouds. Staying with my parents for the weekend, I noticed that there were some new geocaches set in Wivenhoe Park, the grounds of the University of Essex. Dad used to work there for years, and so I had been quite familiar with the place, but I hadn’t been for a look round in ages. I had a walk round most of the grounds and this image was close to the end of my stroll. It’s the Vice-Chancellor’s residence on one of the lakes in the Park. 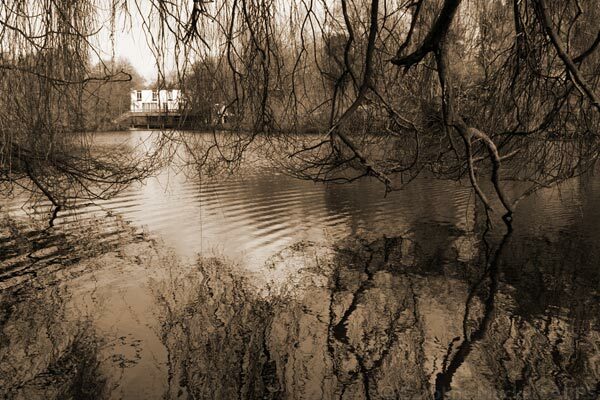 A duck swam off to provide some ripples in the water, and I framed the scene with the as-yet leafless willows.